Rucker Equipment L4701 HST Package Deal | Rucker Equipment Co. Call a member of the Rucker Equipment sales team today at 903-729-6951 to take advantage of this special, limited-time offer. Apply to finance your new Kubota today or stop by Rucker Equipment and we will walk you through the simple process. More power, cleaner emissions and a bold new look position the new Standard L-series tractors at the top of their class.The Standard L-Series has not only improved performance but also feature a revamped design with smooth, rounded contours from front to rear that improve visibility so you can get the job done faster and with ease in the comfort of the New Standard L-Series Tractors. HST Transmission: Kubota's 44.5cc Feather-Step HST features a hydraulic servo system that increases pedal responsiveness, providing easy pedal shifting operation for smoother performance and improved control. The brake pedals have been relocated to the left side of the operator platform allowing more foot space on the L4701HST. Plus, it features a hand operated, step-less cruise control, which keeps your working speed constant. Cruise control is standard on the L4701HST. Hydraulic Independent PTO: The L4701 models have this convenient feature that lets you operate the hydraulic independent PTO without using the clutch. Large Capacity Fuel Tank: The L4701 models feature a 13.5 gallon fuel tank. 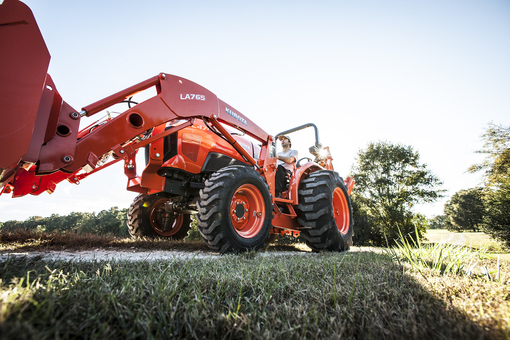 Operate longer between fill ups with the large capacity fuel tank on the Standard L-Series. Cup Holder: This convenient holder securely fits a cup or a mug to keep operators hydrated on the job. Tool Box: A large tool box is located right behind the operator's seat for easy access. Models with the backhoe will have the tool box above the left fender, next to the operator's seat. New Dash Panel: The dash panel features large gauges and a digital LCD panel that provides vital information including engine error codes. Parking Brake and Diesel Particulate Filter (DPF) indicators have been added to the dash panel. New Seat: The adjustable suspension system offers a high level of comfort. The seat is contoured and ergonomically designed to reduce fatigue when working long days. A drain hole has been added to allow water to escape so it does not accumulate on the seat. Roll-Over Protective Structure (ROPS): For maximum protection, all models come with a foldable ROPS and a retractable seat belt as standard equipment. One Piece Hood: The Standard L-Series sleek slanted hood provides a great field of vision. The one piece hood can be fully opened with the assistance of a gas strut for easier access to the engine and other maintenance items. Financed thru KCC*, zero-down, with extremely low APR financing (typically less than 1% APR): $40,002.00 minus $6,879.00 equals $33,685.00 or about $581/month for 60 months. Call 903-729-6951 or stop by for complete details. Package does not include physical damage insurance, applicable taxes, or fees. Call a member of the Rucker Equipment sales team at 903-729-6951 today to take advantage of this special, limited-time offer. *W.A.C Photo for illustrative purposes only. Looking for deals on Kubota or Stihl products? Click on the "SPECIALS" tab at the top of any page. If you're looking for a fantastic tractor package take a look at "PACKAGE DEALS" under the Showroom tab at the top of any page. Five out of five stars. Enough said. Worked with Jim at Rucker Equipment on the purchase of a new tractor. Easy in - easy out with no hassles. Had a minor issue that was taken care of immediately. Good people to deal with, with quality equipment. Before I bought my Kubota zero turn I was mowing 4 acres in 6.5 hours. Now I'm done in 3! I could not be happier! Great purchase! Thanks Rucker! © Copyright 2019 Rucker Equipment Co.